George Washington's death on December 14, 1799, dealt a dreadful blow to public morale. For three decades, Americans had depended on his leadership to guide them through every trial. At the cusp of a new century, the fledgling nation, caught in another war (this time with its former ally France), desperately needed to believe that Washington was—and would continue to be—there for them. Thus began the extraordinary immortalization of this towering historical figure. In Inventing George Washington, historian Edward G. Lengel shows how the late president and war hero continued to serve his nation on two distinct levels. The public Washington evolved into an eternal symbol as Father of His Country, while the private man remained at the periphery of the national vision—always just out of reach—for successive generations yearning to know him as never before. INVENTING GEORGE WASHINGTON by Edward Lengel is a look at how the perception of George Washington has changed over the last 200 plus years. As editor in chief of the Washington Papers and a professor at the University of Virginia, Lengel appears well qualified to author this book. INVENTING GEORGE WASHINGTON is not a biography but a history of the legends, myths and facts about George Washington. Lengel points out that the perception of Washington is tweaked in each generation to fit the expectations of the time. He references the writings of many Washington biographers to point out some of the half truths, exaggerations and lies that have complicated our ability to know the “real” Washington. The mishandling of Washington’s letters and papers by his ancestors also confused matters. Lengel tells the reader that the images of Washington have ranged from deifying him to debunking him and everything in between. 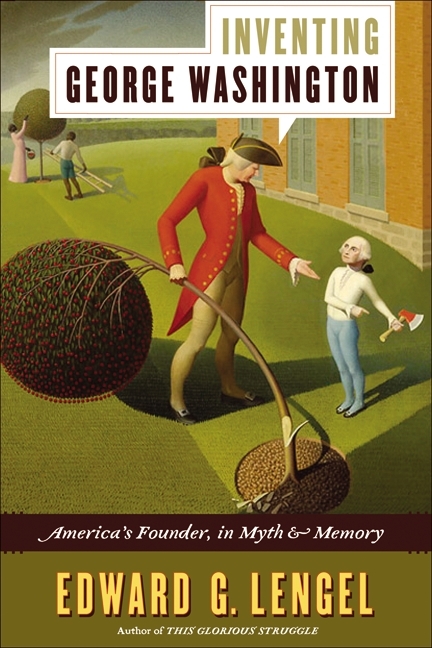 Some of the legends that Lengel has addressed in his book include chopping down of the cherry tree, Betsy Ross and the first flag, fighting Indians, wooing women, defying bullets, a slave child, the origin of the phrase “so help me God” in the presidential oath of office and the Washington slept here phenomenon. Many have capitalized on the country’s fascination with George Washington – some legally and some illegally. People have forged his letters, made false claims about his life and death and sold fake artifacts. Politicians and commentators have inaccurately attributed statements to Washington to suit their agendas. Special interest groups also claimed Washington’s support. For example, gun lobbyists say he was a strong gun advocate, Christian groups assert he was a practicing believer who prayed constantly, and other groups attribute homosexuality and marijuana use to support their causes. Stories about Washington’s reincarnation, his ghost and his meetings with extraterrestrials have also been put forth. INVENTING GEORGE WASHINGTON is a very entertaining, well researched book. I found it interesting to compare my perception of Washington before and after reading the book. It also helped me recall many of the stories I was taught in grade school as factual. I would recommend this book to anyone with an interest in Washington, particularly those who teach history to children. Thanks to the publisher for sending a copy of this book and to Booking Pap Pap for his thoughtful review. Oh my gosh, my doctor was telling me about this book just last week! He had good things to say about it as well. I love Booking Pap Pap's reviews! I'm with Kathy - love his reviews!!! Well ...Pap-Pap's review is so great that I'm getting this book for a history-buff friend who loves all things Washington! I was just in DC and i was longing for a little American history! Interesting to compare the legends/lore with facts. Thanks to Booking Pap Pap for sharing his thoughts! I've been curious about this because I like to read history and the Revolution is one of the eras that interests me. Thanks to Booking Pap Pap, I'll add this to my list.